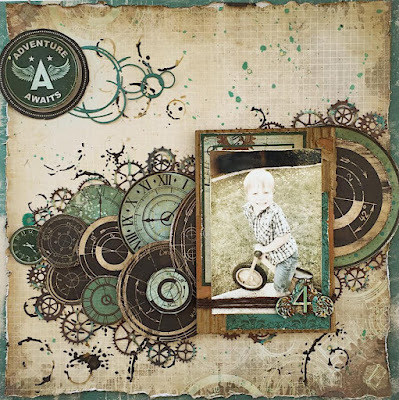 Scrapping Fancy: Swirlydoos Kit Club September Reveal and Blog Hop! Swirlydoos Kit Club September Reveal and Blog Hop! Thank you for joining our blog hop this month! If you came here from the Swirlydoos blog, then you are on the right track. If not, go back to Swirlydoos' blog and start from there. Make sure you leave a comment on all blogs for a chance to win a prize! And, make sure you have LIKED & FOLLOWED Swirlydoos on Facebook!!! Are you a subscriber? If so, your kit is on it's way if you don't already have it! 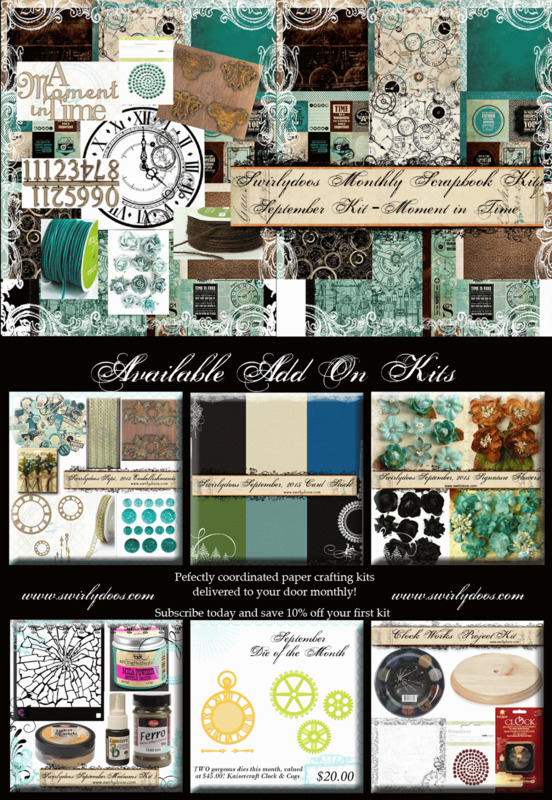 If not, check out the Swirlydoos store to see if there are any September kits or add ons in the store! I was super excited to get the Moment in Time kit! It has my favorite color combos and the Kaisercraft paper is PERFECT! I dug right in! This cute boy in the picture is my sweet, sweet Elijah. This page is made using only products from the MAIN KIT. I did use some dies and my own media. I have a complete step-by-step tutorial with TONS of pictures on the new Swirlydoos Snapguide account. You can view the tutorial HERE. This is my take on the monthly sketch. I tucked some border punch strips in between some of the layers. I also used an older Prima stencil and some white embossing paste under the design, then added some stamping. It's not my normal style, but I thought I would try it out. I added some of the bling along the edging of the stencil and over the stamping. The black vine is a die cut from a Kaisercraft die that I bought from the Swirlydoos store some time ago. Any vine die or chipboard from your stash would do the job. The title is also a piece of chipboard from my stash, but you could easily make your own title from alphas or other chipboard you have on hand. HOLY LAYERS! 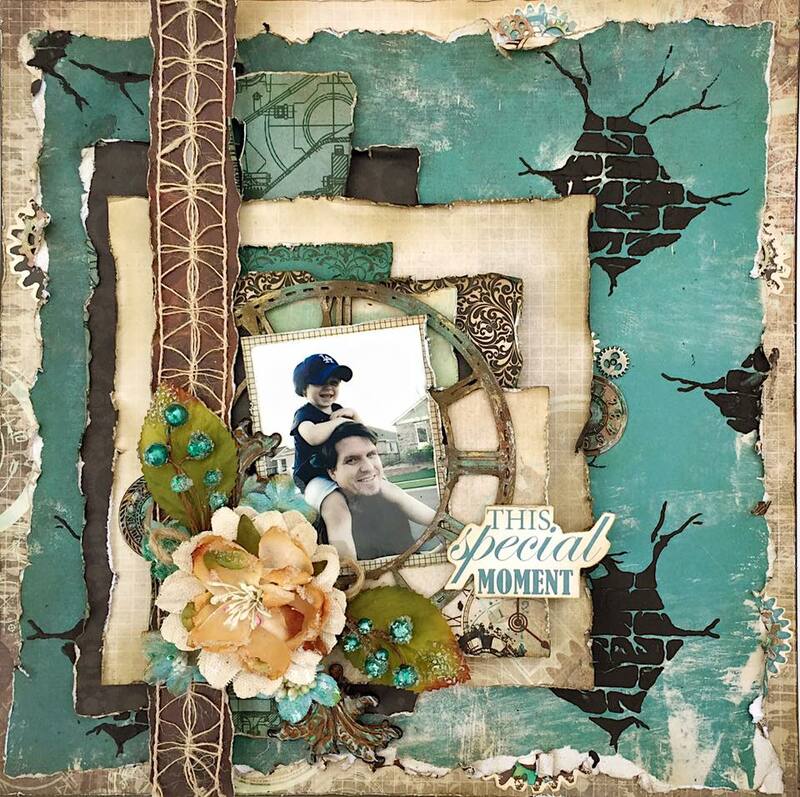 I kind of went nuts with the layers on this layout! This is actually going to go in a frame and hang on the wall. Blue and brown are my home decor colors, so I'm picking and making layouts to go up on the wall. I knew I would have a ton of extra space for this one, so I just popped every layer for a lot of dimension. I used the collectible gear die cuts in between the layers, and some metal gears from my stash. I also used a new brick stencil and some black embossing paste I had on hand to create this look. Any brick stamp or stencil would work to get the same effect. I broke up the Prima metal piece that came in the embellishment add on and added them to the flower cluster. 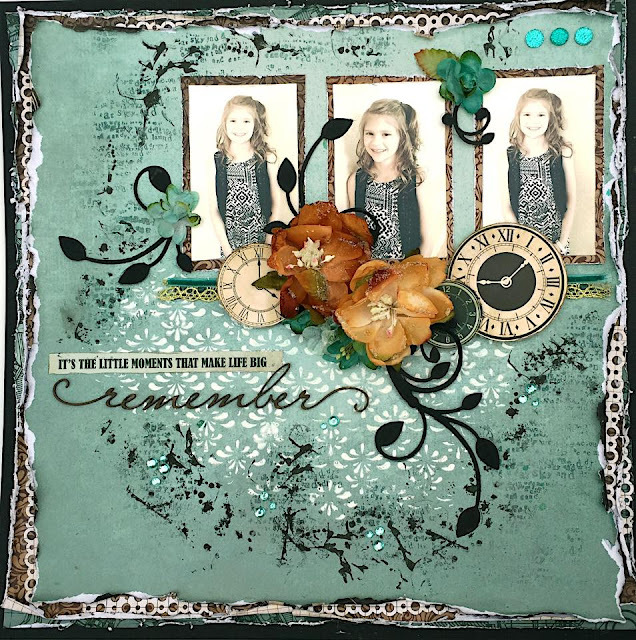 I created a patina look by adding some Silks paints in green, blue, and gold. I also used this same techinque on all of the metal. This is my clock that I made using this month's project add on kit. I'll be sharing my process video on how I created this on Saturday, October 3rd, on the Swirlydoos YouTube channel, so be sure to check it out! Thanks for checking out my projects, and I know you will be amazed at the other ladies' fantastic creations, so keep hopping along! Yay! My first blog hop for my first kit! I adore the colors and then we for Sept. 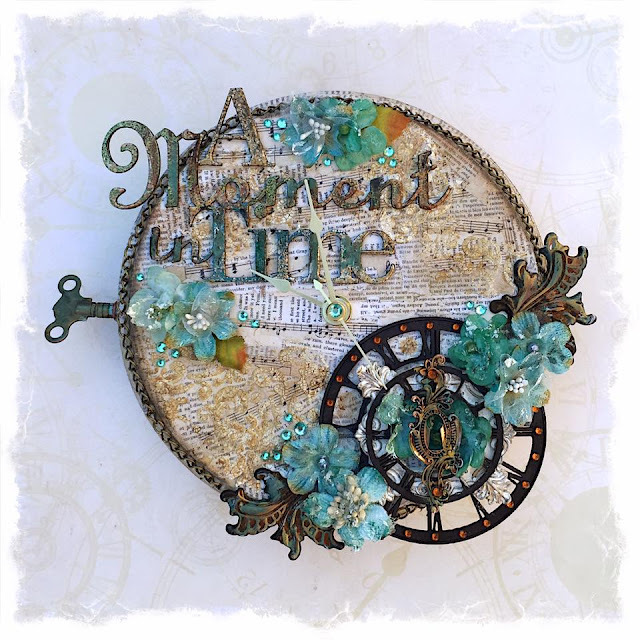 These altered clocks have me drooling! Gorgeous projects!! Love them all!! Beautiful layouts Rae! Your little girl looks so much like you! Love your stencilling and inking in that LO. And the layers!!!!! Love all your layers and what you've done with the metal. The clock is fab! Gorgeous LO's, Rae! And that clock is amazing! I just love the colors of this kit! the layouts are beautiful. Love the color - kind of an aqua. All of the different clocks are so fun. thanks for sharing some wonder pages. Beautiful pages with lovely details! I love the color combo in this pretty kit! Beautiful, Rae! Love that brick stencil and your layers. All of these are just gorgeous! Love the layouts - these colours are just my thing!! Beautiful work Rae! I enjoyed the snapguide tute, and love, love, love your clock and "Remember" layout! Wow I love all your projects!! My favorite is "Adventure Awaits" I plan on scrap lifting!! TFS!!! I love your clock is so beautiful!!!! and awesome!!! Fantastic layers! I love the look that they create. Definitely inspiration for my own work!